Being one day in the country at the house of a friend, the learned Mr. Logan, he showed me a French book filled with magic squares, wrote, if I forget not, by one Messr. Frenicle, in which, he said, the author had discovered great ingenuity and dexterity in the management of numbers; and, though several other foreigners had distinguished themselves in the same way, he did not recollect that any one Englishman had done anything of the kind remarkable. I then confessed to him that in my younger days, having once some leisure which I still think I might have employed more usefully, I had amused myself in making these kind of magic squares . . .
Benjamin Franklin (1706-1790) often amused himself and his newspaper and almanac readers in colonial America with "Mathematical Diversions." He discovered a method of constructing "magic squares" of sequential numbers that would create the same sums in the rows, columns, and diagonals. This is one of his 3 x 3 magic squares. ​ Such a design may appear to be a puzzle for young students or bored newspaper readers. In fact, magic squares are still a subject of research, despite their long history. They have applications in cryptography and cryptanalysis (code-making and code-breaking), geometric forms, and number patterns. This only magnifies the accomplishment of a man who drew them as a doodle (he once wrote apologetically that he explored the possibilities of his magic squares during meetings of the Pennsylvania Assembly). One of his 4 x 4 magic squares is below. Use sixteen of the numbers to create a Franklin Magic Square by clicking and dragging the numbers to empty spaces on the grid on the left. There is more than one solution; in fact, there are more different solutions for the 4 x 4 than the 3 x 3. Why do you think this is the case? 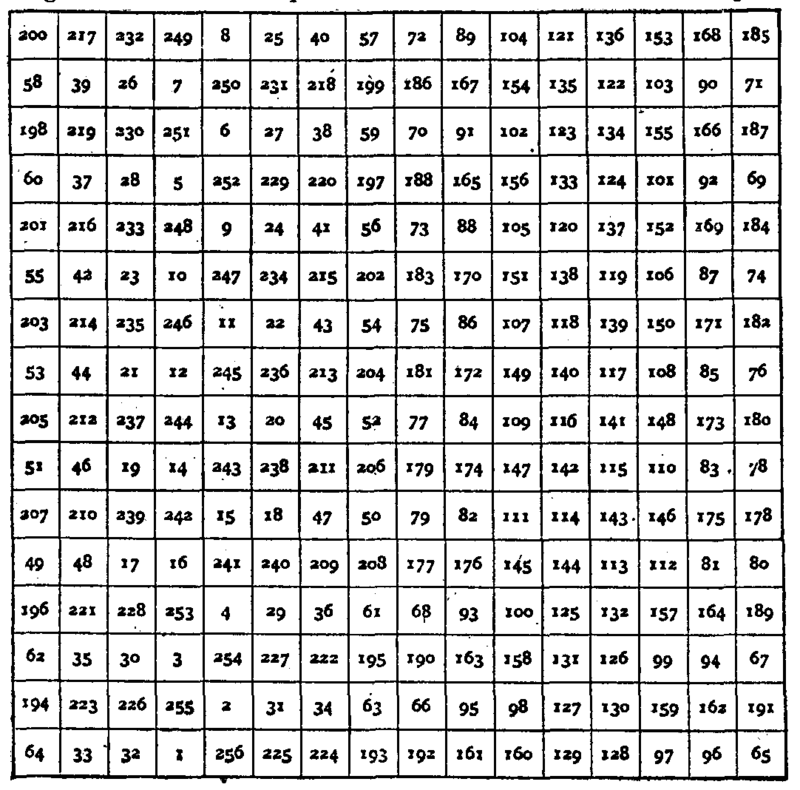 An example of Franklin’s 8×8 magic square is shown below. The rows, columns, and the V-shaped lines Franklin called "bent diagonals" provide the sum of 260 (but it is interesting to note the main diagonals do not add to 260). There are other curiosities to notice too, such as the 4 corners with the center 4 squares add to 260. Mr Logan then showed me an old arithmetical book in quarto, wrote, I think, by one Michel Stifelius, which contained a square of 16x16 that he said he should imagine must have been a work of great labor; but if I forget not, it had only the common properties of making the same sum, 2056, in every row, horizontal, vertical, and diagonal. Not willing to be outdone by Mr. Stifelius, I went home and made that evening the following magical square of 16, which, besides having all the special properties of [his earlier 8x8 square], had this added: that a four-square hole being cut in a piece of paper of such a size as to take in and show through it just 16 of the little squares, when laid on the greater square, the sum of the 16 numbers so appearing through the hole, wherever it was placed on the greater square, should likewise make 2056. But the compliment is too extravagant, and therefore, for his sake as well as my own, I ought not to repeat it. 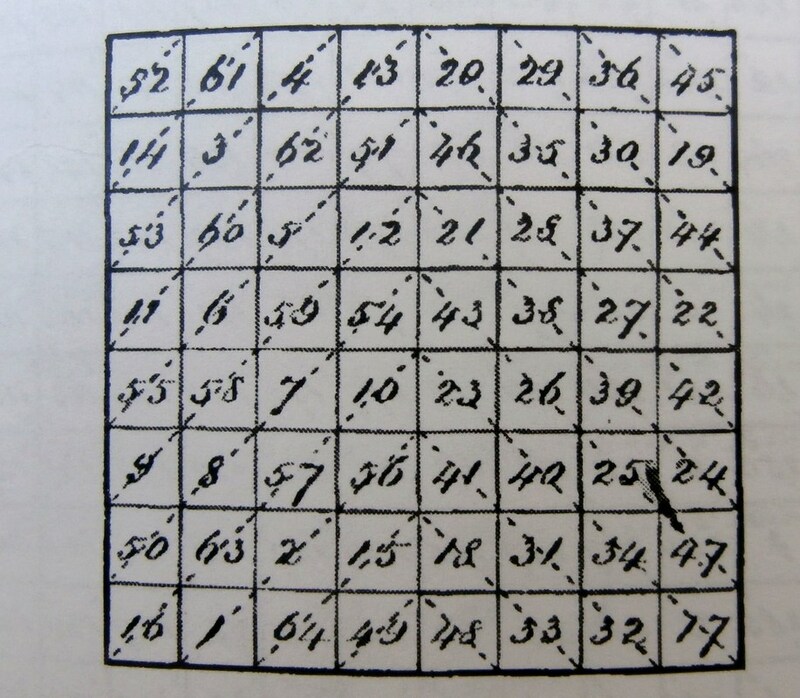 Nor is it necessary; for I make no question but you will readily allow this square of 16 to be the most magically magical of any magic square ever made by any magician. Good question! A dozen scholarly reports were devoted to Franklin squares in the 20th century. Some use mathematics analysis tools not yet developed in his time. Some use techniques working backwards from the completed square to look for patterns. Not one of these authors has found a method likely to have been the one used 250 years ago. There are (64x62x62x61 . . . x2x1)/8 (or 1,590 followed by 86 zeroes) different ways to arrange the integers from 1 to 64 in an 8 by 8 array. Ben Franklin must have followed an algorithm, system, or pattern, but no one has yet uncovered what it was. We can "see" the system by tracing the integers in order in a completed square, but describing it is not the same as understanding the construction. How could Ben Franklin know in advance that this arrangement would work? Not bad for a colonial American scholar whose early experiences in "arithmetick" were "unpleasant and unproductive," according to his autobiography (link to Project Gutenberg text). Ben Franklin made his mark in mathematics, in the same way he did as a scientist, inventor, diplomat, postmaster, public library founder, journalist, and author.